Therapy Services at the Royal Orthopaedic Hospital include Physiotherapy, Occupational Therapy, Orthotics and Podiatry. Physiotherapists treat people of all ages, helping them manage pain and using a number of methods to aid recovery. 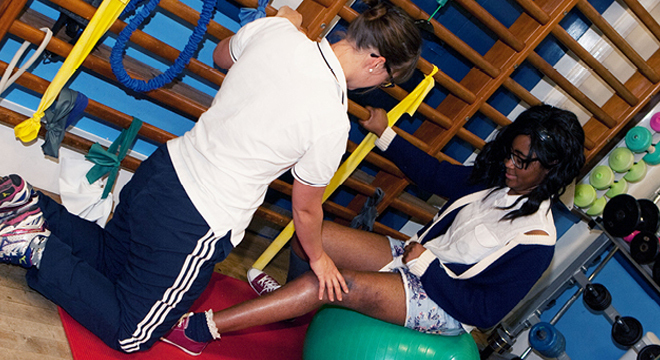 Our physiotherapy team is an integral part of the service offered at the Royal Orthopaedic Hospital. Click here for more Physiotherapy information. Click here for more Occupational Therapy information. Orthoses are devices you wear to either to change the way the body part works whilst moving or provide cushioning or support. Podiatry is a branch of medicine devoted to the study of diagnosis and treatment of disorders of the foot, ankle, and lower extremity. Click here for more Podiatry information. Speech and Language Therapists provide support for individuals who have communication and or swallowing difficulties. Input from a qualified speech and language therapist is provided to inpatients, over the age of 16, at the Royal Orthopaedic Hospital. The service is for people who have problems with speech, voice, language, and/or swallowing. This can be as a result of an illness or surgical procedure. If you have difficulty with speech, voice, language, and/or swallowing, the Speech and Language Team is available via 0121 371 3483.